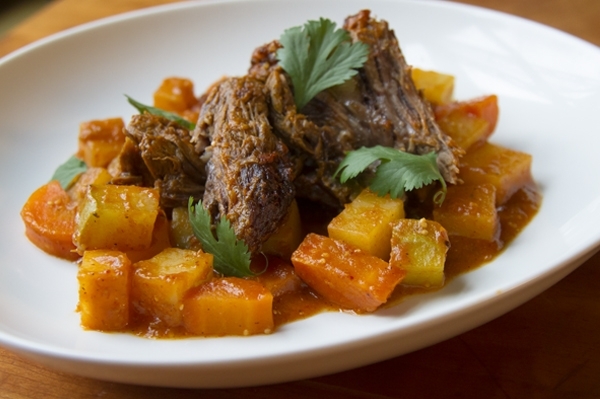 Taken as I am with the with the texture and flavorful depth of honest-to-goodness American pot roast, I just love the Mexican flavors of roasted tomatillos, garlic and smoky chipotle chiles even more. In the same pot, with a chorus of Mexican-American vegetables, the meat and sauce become a whole. This is, simply, classic comfort food that’s perfect for a cold afternoon or evening. Invite some friends over, serve the roast with some good crusty bread and a bottle of rustic red wine — something from France’s Rhône Valley or Italy would be nice — and settle comfortably into winter. Quick note: You can substitute equal-size pork shoulder roast (or equal weight of chicken thighs). The chicken and vegetables can cook together, a total of about 40 or 45 minutes. For the roast. In a shallow dish, smear the meat with the salsa, cover and refrigerate for several hours (the longer the better--up to 24 hours--to infuse the meat with the smoky flavor). When you’re ready to cook the meat, turn on the oven to 325 degrees. Scrape as much salsa as possible off the meat and reserve. Dry the meat on paper towels and sprinkle with salt. Heat the oil in a heavy, medium-size (4-quart) pot (preferably a Dutch oven) over medium-high; when hot, add the roast and brown on one side, about 5 minutes, then flip and brown the other side. Remove the roast to a plate; pour 1 cup of water into the pot and boil over medium, scraping up the browned bits. Stir in the reserved salsa, then return the roast to the pan. Cover tightly and bake for 2 hours, until the meat is just tender. Distribute the vegetables around the meat, stir to coat them with the pan juices; cover and continue cooking until the meat and vegetables are tender, 30 to 45 minutes. Serving. Use two large metal spatulas (or meat forks) to transfer the roast to a large, warm serving platter. Scoop out the vegetables with a slotted spoon and distribute them around the meat. Skim off the fat from pan juices, and if necessary, boil them to reduce until lightly thickened; there should be about a cup. Taste and season with salt if necessary, then splash the sauce over the meat and vegetables. Sprinkle the whole dish with chopped cilantro and a bit of coarse salt, then carry straight to the table. Advance Preparation: The salsa can certainly be made a day or two ahead, as can the whole dish, though the texture of everything is certainly best right out of the oven. If done ahead, refrigerate, covered, then rewarm in the oven adding a little water to the pan juices as they reheat, if they have thickened too much. Variations and Improvisations: An equal-size pork shoulder roast or equal weight of chicken thighs can be substituted for the beef (chicken and vegetables can cook together--a total of about 40 or 45 minutes). Other cuts of beef to use include sirloin tip, rump, top round or eye of the round, almost all of which are leaner and will need to be very tightly covered to insure they won’t dry out. I made it with Butternut Squash instead of the Carrots and it was Excellent. can i get a nutritional breakdown for this recipe? Season 12 of Rick’s TV Show is About to Begin! 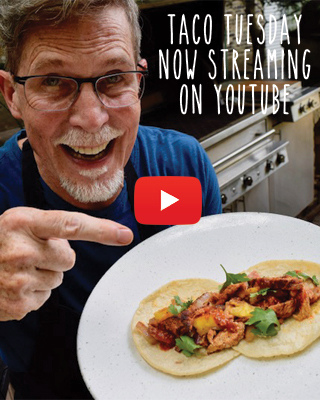 COPYRIGHT © 2014 RICK BAYLESS. ALL RIGHTS RESERVED.